Yesterday David and his dad painted the nursery, installed some custom closet shelving, and put the crib together. It's getting very real and just a little bit scary. Baby boy is coming in a few short months whether we're ready or not. 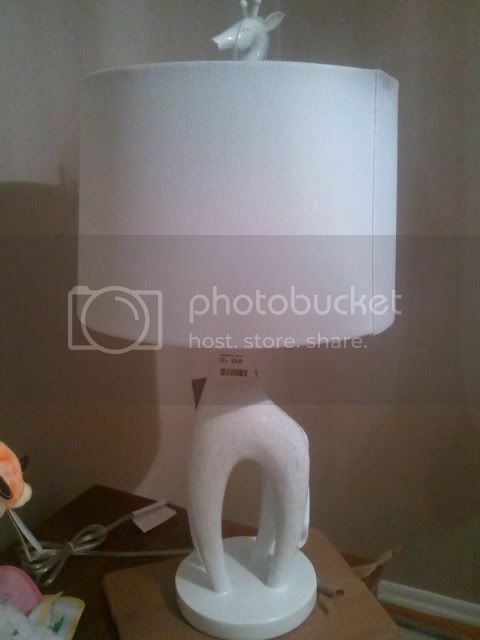 The other day while shopping at Home Goods, David and I found this adorable white giraffe lamp for only $30! It's the perfect addition to our whimsical nursery and we couldn't be more pleased to have purchased it. We scored quite the deal since the Jonathan Adler version retails for nearly $400. I can't wait for the room to come together so I have something to share with all of you. Oh, and this weekend David and I are planning to register. We're a little overwhelmed and could use any tips, tricks, or advice on baby items that you've loved or hated. We're all ears. After having two kids my biggest piece of advice is: theres so much you dont need with a baby! Every gadget, swing, bouncy seat,etc... This is purely my opinion but it takes up a ton of space and you end up not needing most of it. Think about your daily life and tailor your registry to that. If you have lots of family and friends nearby, you'll have plenty of hands to hold the baby and wont need tons of equipment:) It becomes more of a hassle than anything else. Very whimsical! ;) Love you! Don't forget a boppy (very handy), ear thermometer, lots of swaddling blankets so you can use them for changing, etc. Great find on the lamp! I found it helpful when registering to have a friend who has had a baby/babies to go with you once and make sure you have all of the essentials (beyond the cute, fun stuff for the registry)....baby toiletries/feeding, etc. :) Also, put everything you need, including big things...people will go on them together and it helps you out a bunch! Cute lamp! My advice is to not bother registering for clothes. People buy what they want anyway and the stores move clothes quickly so they tend to be out of stock by the time people make purchases. Our favorite/most used items were: Aden and Anais swaddle blankets, Rock and Play (we used it like a cradle for sleeping), side snap long sleeve t-shirts, Halo sleep sacks, baby bathtub, Ergo with insert, bouncy or vibrating chair. I love that lamp! I am still decorating our nursery since my son decided to make his debut early and now he is almost 4 months, time flies by! I just love that lamp! It will fit your whimsical nursery perfectly. -My sleep sack. I started using it when she was old enough to roll over. It kept her warm even if she wiggled out of her blankets but still left her arms free and she could kick her legs. My friends all swear by them too. -Sophie the Giraffe. It's way overpriced but honestly was my daughter's preferred teething toy and worth the money. -I also loved my Bumbo chair and tray because it doubled as a high chair when we went anywhere until she got too big for it. And a swing was wonderful, but they really only use it for a short time You don't really stick an 8 month old into a swing haha. I'd recommend borrowing one - ours was used for only the first couple of months and not even that often. Preferred my bouncy seat as I used that to bring her in the bathroom when I showered, to put on the table while I made dinner, and it was small enough to take with us places. On nights when I was up all night I would lay on the couch and rock the bouncy seat with my foot to get some rest. -We got a high chair that was just a seat that sits on a regular chair. I much preferred that as it took up less space, and it was less "In your face" baby gear in my pretty room. It was less expensive and turns into a booster seat later. Love the lamp! Can't wait to see it all come together! Definitely register for clothes up to 12 months in size! And diapers in bigger sizes, too! The Itzbeen timer was a lifesaver for me! Other things: extra crib sheet/mattress pad, changing table cover, monitor, thermometer, first aid kit. Oh the registry. It is a fun and scary thing isn't it? :) To tell you the truth we didn't receive all that much off our registry, but I'm glad we were able to use the 10% completion coupon. In there I also link to Shawna's of Styleberry Blog. I swear she tends to know all the cool fun stuff that you wouldn't necessarily find at Babies R Us. Good luck! I can't wait to see your nursery it's gonna be so adorable & unique! I recommend a bouncy, bumbo, wipes warmer, diaper pail, and most important, because i use this all the time with my 4 month old, bjorn baby carrier. It comes in handy when you cant put the baby down but need to do stuff. How adorable...such a great find and it looks so much like the Jonathan Adler...lucky you!! Sweet deal on the Adler-esque lamp, J! Baby S is going to adore it. 1. We printed our registry & gave it to a friend who's an experienced mom. She looked it over & really helped us edit. 2. Places like Babies R Us give you a list of "must-haves" but it goes overboard so just use it as a guideline! 3. If you're planning to breastfeed, don't bother registering for too many bottles (we were gifted so many bottles we're never going to use so I've donated them). I found that I really only need 3 bottles at any time, even on the days when I exclusively pump & give Quinn breastmilk via bottle. If breastfeeding doesn't work out, you can always have Dave run out & get the bottles you actually need. *front zip-up one piece sleepers (w/ the little footsies) b/c tryng to pull a onesie over a newborn's head can be a tortorous experience! Whoa, longest comment EVER. I'm sure I'm forgetting something...I'm always available if you have q's! Baby Gizmo book and website are both very helpful, I used the book to determine necessities and the website for reviews of particular items. Best wishes! too cute!!! what a great find. i love it for a nursery, especially. whimsical and youthful, yet chic. Have to give it up to you, Joi! Who else would find the perfect JA giraffe knockoff! You are such an amazing bargain hunter. I'm so excited to see the finished nursery and I can't believe he's gonna be here so soon. Great Score on the lamp girl, congrats on everything! 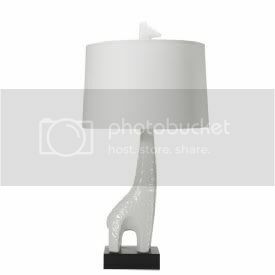 Love this lamp....what a steal and it will look amazing in your space! My biggest baby gear piece of advice is the book baby bargains. We were so lost and it really helped us wade through it all. Good luck! a good swaddle blanket is a must. especially if it turns out he is "colicy" or has reflux. this one is cute, its nice and big which is very important.